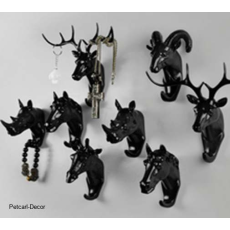 These are wall hooks in which apart from being functional they are also decorative. They provide more storage space in a room and they also complement the design and color scheme of the area. Some of them like the digits’ hooks are also educational especially to small kids, others show creativity while others like the animal heads show the love one may have for wildlife. They can be applicable anywhere like in the kitchen, kids’ bedroom, schools, living rooms, bathrooms, hotels etc. One can hang things like coats, hats, bath towels, mirrors, kitchen towels, pans, photos, bags, chains, belts, calendars, clocks, keys etc. This hooks are modern, unique and come in different styles and sizes.